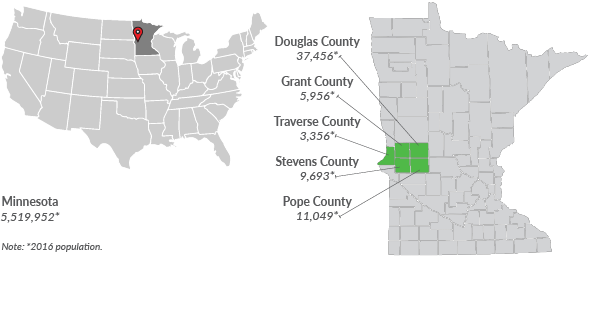 In 2015, three previously independent health departments in West Central Minnesota consolidated into one new health department called Horizon Public Health. This five-county, regional public health organization serves approximately 67,000 people. Summary report: This report was published in 2015 and provides a summary of the site’s activities during the time it was a demonstration site in the Center’s Shared Services Learning Community. Site visit report: The Center visited the site in October 2013. This report documents the activities from the site visit as well as some of the Center’s observations. Project Description: This report provides a timeline of activities between January 2012 and January 2015. For more detailed information, read the sites Restructuring Updates. Commissioner Todd Schneeberger (right) sits with other members of the Horizon team.